This morning we awoke to birdsong. Yes, song. No more raucous chattering of magpies. Could the plague have passed? A different, territorial, conflict took place. From our window we joined the audience of a wren and a wood pigeon watching a stand-off between two robins. The victorious combatant joined them on the fence and they were all lined up, respectful distances apart, surveying the terrain. Maybe congratulating themselves on having survived the various avian threats. It was a bit like a surviving gladiator joining the spectators in the Colosseum. During the afternoon a couple of the predators returned to the trees on the embankment. A wandering cat caused them great consternation and silenced the rest of the birds. They didn’t silence my rest, though. They simply disturbed it. In fact another kind of invasion seems in the offing. I mentioned in a previous post a man having commandeered the patch of unused land alongside our garden fence. He is now nailing supports to our fence – not just the posts, but the more flimsy panels in between. We are simply tenants and don’t have access to the garden which is really the home of the foxes, otherwise I might go and have a word. However, when he started belting these nails in and shaking the fence I thought I’d better ring the landlord and let her know (I know, I know, the word land lord is not appropriate for a woman, but the two of them seem happy with it). I got an answerphone on which I left a message. Later in the evening, not having received a reply, I went to investigate. His runner bean canes are not actually touching our fence, but what he was nailing in place was a rambling blackberry. En route to Cannon Hill Common I stopped and chatted to the younger proprietor of the Martin Cafe. This, of course, meant that I was bound to go in for a fry-up on the way back. So I duly did. It seemed only right. On the common there were masses of dog roses in full bloom festooning other shrubs, and brambles were beginning to bear blossom. Walking along the lakeside I noticed, attached to a couple of trees, laminated flyers stating that, from tomorrow, fishery in the lake would be managed by The Wandle Piscators, a private club. Whilst, admittedly, the club invited new members, it would no longer be legal for the general public to fish these waters. Was this another nail in the privatisation coffin which has been built to contain public service and real freedom to be an individual? I pondered on this, and whether the ban would extend to free spirited small boys gathering newts, as I continued my walk. This took me past a group of mothers and toddlers happily feeding the ducks on bread. I think it was in Regents Park that I once spotted a notice advising people not to give the birds bread and advising of the dangers to them inherent in this. I thought it best not to mention that. It is, after all, one of the greatest pleasures of young children and an excellent way of occupying them and providing a social outlet for their mothers. I don’t think that, however polite and genteel an informant such as I may be, I would have been seen as anything other than a killjoy, if not an interfering old git. Further along, strapped to a bench inscribed IN LOVING MEMORY OF ALLAN WILLIAM MARSHALL, who died in 2008, there was a vase filled with fresh flowers in clean water. Someone mourns him still. Beyond the lake I took a footpath parallel to the common which brought me out onto Grand Drive. Was this the route taken by those two small boys all those years ago? Unless Chris remembers I guess I will never know. Up Grand Drive, left into Southway and I was soon back on the common having a last stroll back along the lake and on to Martin Cafe. This time I chose to stop and chat to the one solitary angler I had noticed first time round. I wondered what was his view on the Wandle Piscators? Well, he was going to join. He saw no harm in it although he would rather it wasn’t happening. If it improved the quality of cleanliness and management it could be a positive thing. He didn’t think £25 per year was too much to pay for any potential improvement. He confirmed what I had surmised, that this was the club that fished the Wandle in Morden Hall Park. They were therefore an established organisation. What I didn’t tell him was that the National Trust litter picker had told me that the fishermen left lots of rubbish. My companion here was therefore likely to be disappointed in his hope that under new management the litter bins might actually be emptied before they had begin to spill their contents. He, himself, had been fishing here about ten years. There were others, however, in their fifties and sixties who had regularly fished there since they were seven years old. They had formed considerable opposition, but to no avail. I guess progress means regulation. Tonight’s repast was my sausage casserole, using Sainsbury’s pork and herb sausages and bearing less and less resemblance to Delia’s original. I finished off the Minervois whilst Jackie had a Peroni. And so to bed and a few pages of ‘The Remorseful Day’. The magpie wars continue. Not simply in our garden and the adjacent railway embankment, but also on Cannon Hill Common, where I walked today. Parakeets in an oak tree were particularly excited by them. I’ve never seen so many magpies. There are two on the grass and two in a fir tree in the garden as I write. And their warning cry gets on your nerves after a while. It really grates. Jackie was visiting a care home off Grand Drive, so she drove me to The Paddocks, award winning, Allotments alongside the common. The plots on this site, the paths between them, and the various communal facilities, are all well tended. I would imagine that every variety of fruit, vegetable, and flower, capable of being cultivated in this country may be found there. It would take a day or two thoroughly to explore it. The lovely morning sunlight dappled the wooded paths in the common itself, and set sparkling the buttercups, clover, and numerous other spring flowers in the well tended meadows. I had to ask a dog-walker for directions to the lake to which, sixty years ago, Chris and I had walked from Raynes Park to collect newts. I don’t recollect any other wildlife on the lake then, but then perhaps I was only interested in newts. The lake is an eighteenth century brick pit which has been filled in. Renovated in 2007 it now supports, and sports, a wide variety of wild life. It is not just parakeets that are newcomers to Cannon Hill Common since 1950. There are mallards, coots, cormorants, and many other waterfowl and birds feeding on the pond life; the lake has been stocked with dace, carp and other fish; there are frogs, and, of course, newts; and bats come seeking insects, perhaps the dragonflies that are in evidence. I would speculate that the newts are descendents of those Chris and I did not catch. Yellow irises and other water-loving plants were in bloom. Beams of sunlight caught a myriad of insects. Walking back to Links Avenue, it being earlier than usual, I was able to walk past The Martin Cafe without entering. A rare occurence. This afternoon in Lidl I got my come-uppance for yesterday’s comments about ‘take care’. Not noticing a wet patch on the polished floor of the store I slipped on it, slid across the aisle, and bashed my forearm on a metal rack. C’est la vie. I had bought the sandals I was wearing, and in which I had just retrodden a childhood path, in Barbados in 2004. I had walked around the island in them, so much so that I became known as ‘the white man who walks’. The local people thought this a sign of not being quite right in the head. 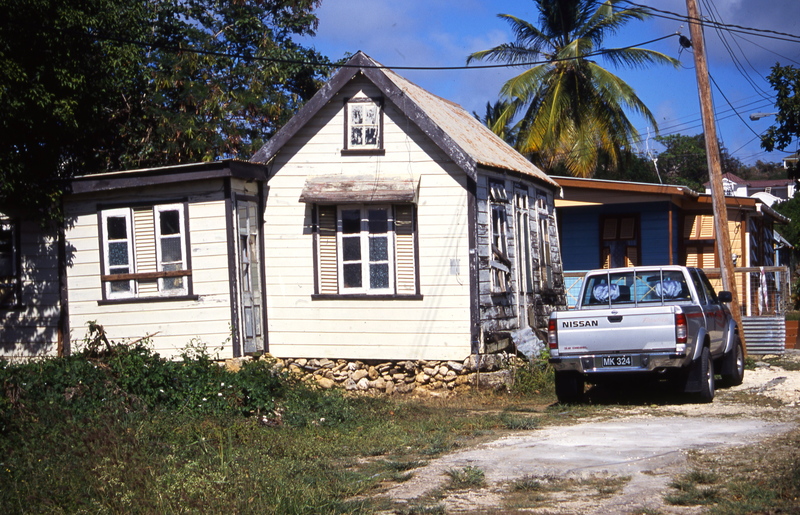 One morning I walked the ten miles from our hotel to Bridgetown along what passed for a main road. Whenever I checked directions I was told I should be on a bus. Not that there appeared to be any bus stops. If you wanted one you leapt into the road and gesticulated. It may have been marginally safer to have been riding on one of these ramshackle vehicles which went careering along the winding roads than to have spent my time jumping into bushes to avoid them. I am not sure. If there was a speed limit no-one adhered to it. Actually I did ride back and the journey was remarkably comfortable. Unfortunately I had wasted valuable time standing in the wrong queue. A certain amount of local knowledge was required to station oneself correctly. Along these roads people lived in chattel houses. 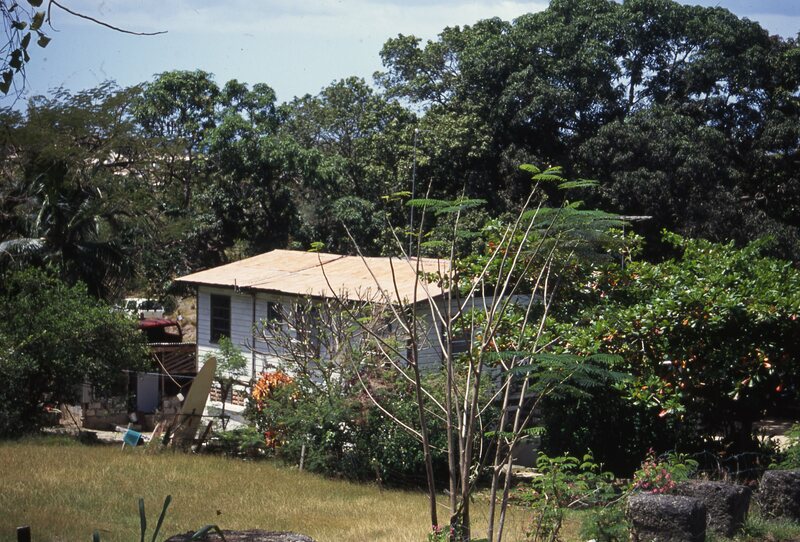 These are portable homes, stout, and some very old. 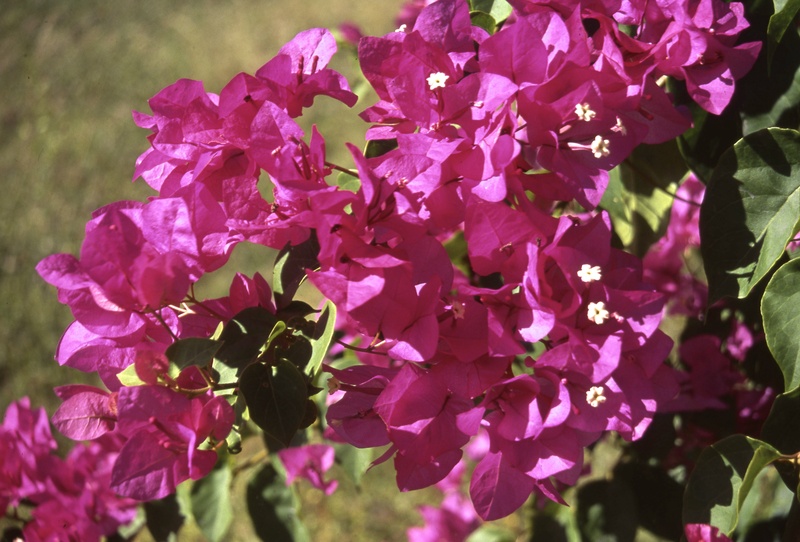 Although people didn’t seem to worry about outside maintenance, the insides looked spotless and the adults and schoolchildren who emerged from them were beautifully turned out; womens’ dresses and children’s uniforms vying with the display of the ubiquitous bougainvillea. This made a long walk which finished in the full heat of the day seem very refreshing. My memory of the juvenile tramp from Raynes Park to Cannon Hill Common was much less so. It was hot, dry, dusty, and to two small boys it seemed a very long way. This evening we had Jackie’s Bolognese sauce with penne from the freezer. Mine was accompanied by a couple of glasses of Pont St. Jean Minervois 2010, whilst Jackie had a glass of Sancere. And so to a game or two of Scrabble and bed. The magpies were cranking up a sound this morning. This time it was the presence of a cat that alarmed them. After an enjoyable visit from my friend Dominic I set off for Raynes Park via Wimbledon and back. In Mostyn Road I overheard two gentlemen taking their leave of each other. In response to one person’s goodbye his companion said ‘now you take care’. Now this is a farewell that really puzzles me. Quite common these days, it seems to imply that if you don’t do what it says something unpleasant will happen to you. Whilst anyone would be advised to take normal sensible precautions, for example when crossing the road, am I really alone or indeed most fortunate in getting up in the morning imagining all will be well? This despite what follows. My chosen route today was along Worple Road where the trolley buses once ran. As I walked past the various hill roads leading up to The Ridgeway and consequently Wimbledon Common, I felt reminiscence coming on. Sometime around 1950 when Chris and I were still at primary school, if you were prepared to walk home, you could spend your bus fare on a bag of broken biscuits from the old style family grocer in The Broadway, or, in season, a pomegranate from a fruit and veg stall in Russell Road. 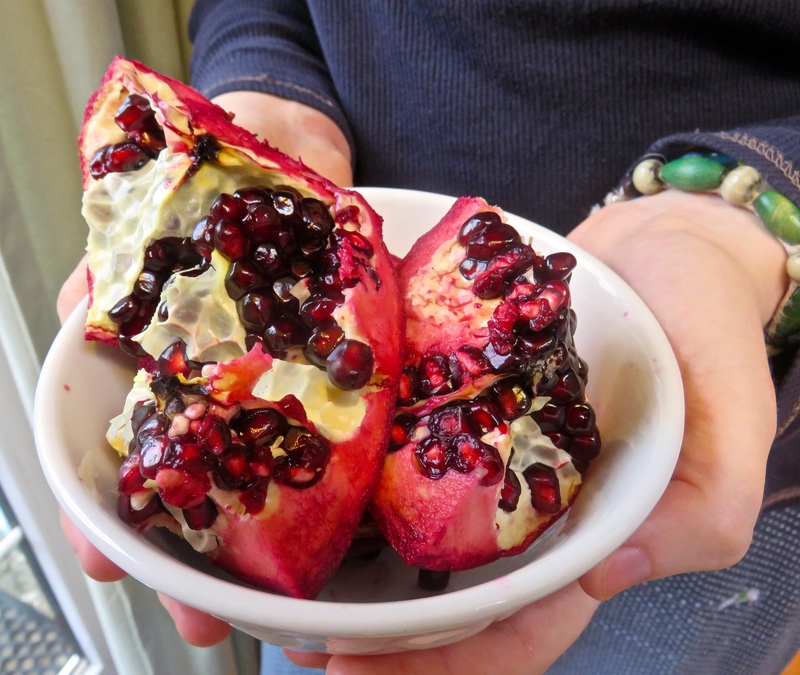 You ate the pomegranite seeds with a pin carried for the purpose. If you wanted an ice cream from De Marco’s alongside the stall that meant walking home two days in a row and managing not to spend the first day’s fare on the first day. One day Chris and I for some reason whilst walking home decided to investigate Spencer Hill. Some way up the hill, in someone’s garden, was a tree with an inviting hollow area at the top of the trunk. I decided to climb up to it and have a look. Chris followed. As I entered the bowl shape in the bole I heard a rather angry buzzing sound. In an instant I was covered in bees. I’d like to say I was out of there like a shot. Unfortunately Chris was bringing up the rear and seemed to have some difficulty in understanding either ‘bees’ or ‘get down’ or all of it. He didn’t seem to grasp that he was in my way. I yelled incessantly until Chris twigged and leapt from the bottom branch. I was then out of Spencer Hill and onto a bus like a shot. Having, of course, spent my fare I had no money. I’m not quite sure what happened about that, but I do remember the concern of the bus conductor for this snivelling wreck with his head in a swarm of bees occupying the first seat on his vehicle. (click for what did happen, now I’ve remembered) Chris must have made his own way home, but I was no caring elder brother at that point. To this day I remember sitting on a stool with Mum picking bee stings and the dead creatures out of my head. I can still see them crawling dazedly inside my fairisle jumper. If ever I lose my hair and there are pitted marks in the scalp I bet they’ll be from those bees. Walking along Worple Road on this very hot day I was struck by a heavily pregnant young Asian woman, her right hand resting comfortingly on her bulge. She didn’t hit me, I just mean I noticed her. Having passed her I stopped and waited and told her that I had been born in July and that summer was a good time to be born. She looked as if it wasn’t a good time to be carrying so I thought I would give her some encouragement. She beamed, thanked me, and said that she too had been born in July. Naturally, after an hour and a half, I felt I had earned a Martin Cafe fry-up, so I stopped for one. On the wall is a large, rather special, framed print which I felt sure I recognised. I spoke to the younger of the two men (I imagine father and son) who seem to run the establishment. In answer to my question he was able to reply that yes, it was Venice. It did not, however, have a family connection. He had bought it from the junk shop next door because he had liked it but didn’t know its provenance. I was, therefore, rather pleased to be able to tell him it was from one of John Ruskin’s marvellous illustrations to his seminal work ‘The Stones of Venice’. Hoping he would retain the information and find it as interesting as I had, I walked back to Links Avenue contemplating the increasing humidity and the telltale little heaps of sand appearing from the joins in the paving stones which herald the onset of flying ants. We are promised a thunderstorm. My main time for listening to music is when I am ironing. Today, whilst listening to Tchaikovsky’ symphony no. 2 (Little Russian), played by the Bournemouth Symphony Orchestra conducted by Kirill Karabits, I pressed, among other things, a beautifully embroidered lace trimmed linen tablecloth and napkins, thinking of the life of the woman who had made them. Jackie has a collection of this wonderfully intricate needlework given to her by various clients during her time as a Home Help some thirty years ago. Many of these people were elderly women who had lost their men in the first world war. A generation of young fiances, husbands and fathers wiped out with no possible replacements. These women, many still wearing engagement but no wedding rings, lived their lives alone, some of their handiwork never leaving their bottom drawers. They were the true casualties of that first time the world went mad. We had salad again this evening, using as always, a tablecloth and napkins possibly 100 years old. I had a bottle of Wells’ Bombardier beer, no doubt named after Billy, the famous boxer. He was before Errol’s time, but I was fortunate enough to know this grand old gentleman in his later years. The air this morning was full of agonised screeches. Otherwise, silence. We couldn’t actually see anything, but suspected the magpies or foxes were doing their stuff. The magpies were certainly about later. Parent birds were offering strong resistance. On my usual route through Morden Hall Park to Colliers Wood, for a change, I took a less trodden path between the back of a factory estate and what seemed to be an almost dry tributory of the Wandle. This turned out to be a rash decision as it was overrun with stinging nettles and I was wearing shorts. The similarly clad German hiker entering this path from the far end, near Deen City Farm, had no interest in my nettle warning. The lingering stinging in my legs reminded me of a similar situation in 2003. 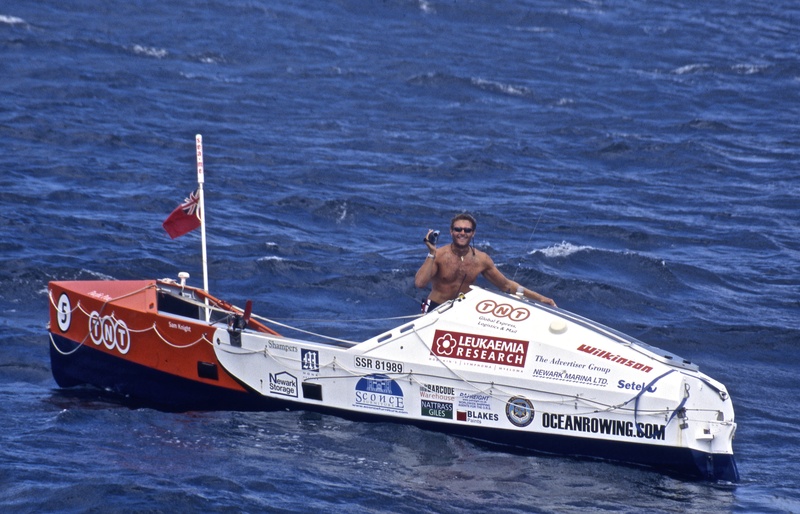 In March 2004 my son Sam completed a solo row of the Atlantic, covering 3,000 miles in 59 days. In doing so, at the age of 23, he became the youngest person ever to have rowed any ocean and won the solo race. The previous summer he had taken delivery of his specially crafted boat at Henley and, with his friend James on board, rowed it to Newark along the linked canals and rivers. I had walked alongside collecting sponsorship. This was an 11 day trek over a distance of 215 miles. En route Mum telephoned me. As often when someone rings a mobile phone her first question was: ‘where are you?’. Now, Mum didn’t realise what we were doing, so she was somewhat surprised when I replied: ‘well Mum, I’m in the middle of a field of head high thistles and stinging nettles – and I’ve got a dustbin on my back’. I then went on to explain that what I had thought was a simple matter of a stroll along towpaths involved some pretty scary diversions, one of which I was in; and the dustbin was meant to collect donations from all the people we would encounter en route. Unsurprisingly there were no donors in this field. I had got myself into this predicament as it had seemed a better option than a field with a bull in it. Upon encountering the bull I had crawled under a barbed wire fence, chucking the dustbin over first, and come to this. I then had to waste more precious minutes ferreting around for those few coins that had been in the dustbin. As I couldn’t see above the undergrowth to gather how far it stretched there seemed nothing else but to press on. Going back would have meant more of the same. Of course, I hadn’t got a clue where I was when I eventually emerged, so I knocked at the nearest house for directions. The woman who answered the door took one look at me, dashed inside, and bolted the door. 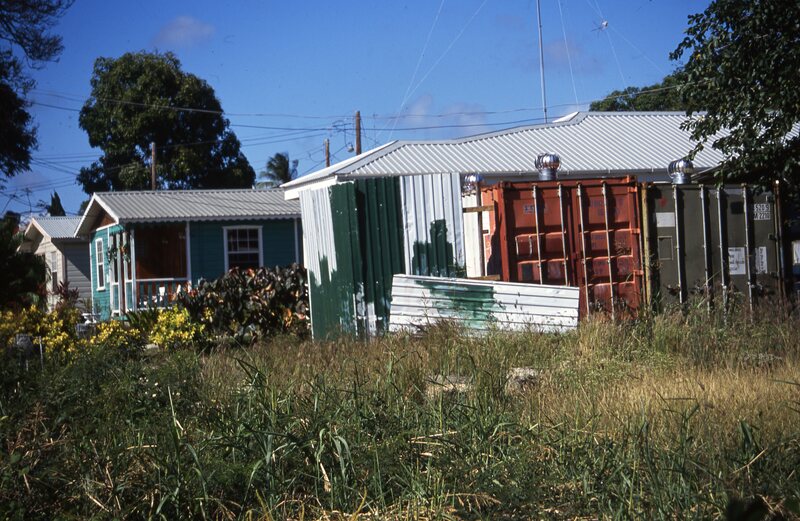 When I reflected that, quite apart from wearing nothing but sandals and a pair of shorts, and being covered in bleeding scratches, I was sporting a dustbin, I began to see her point. Just to add insult to injury, t-shirt-and-shorts-clad Louisa and her friends, in a couple of hours outside Nottingham’s waterfront pubs, collected far more money than I had managed on my magnificent effort. Today’s destination was Waterloo Station where I met my friend Tony with whom I went for coffee at The Archduke. As I entered the tube I tripped over the crossed legs of a seated woman. She was very apologetic. It was not until I had sat down myself that I realised I had stumbled across a rather splendid pair of pins. I leaned across the respectful empty seat between us and said ‘I could think of worse legs to have tripped over’. Fortunately she was rather amused. It’s always a bit risky making such a gesture as it is so easily open to misinterpretation. This was accepted in the spirit intended. It was so hot and humid that this evening’s meal was a salad accompanied by a rather nice Sancerre. This morning’s dominant bird calls at The Firs were of wood pigeons; those without a mate crying ‘uni-ted’, and those happily paired off ‘take two cows taffy, take two cows’. I worked on tidying the bed inside the concrete ring and digging over a bed outlined earlier in the year. The combination of gardening, my mother, and my sisters got us reminiscing about the garden we grew up with in Stanton Road. This was a very small, bare, patch which went with our rented maisonette. I don’t remember much growing there at all except for the Browns’ plum tree suckers and incessant convulvulus. These permanently invaded our garden and it was my job periodically to have a blitz on them. Elizabeth does remember some plants I successfully grew. Mr. and Mrs. Brown lived next door. In sixteen years I don’t remember ever having seen either of them. I think there was a disability involved. Mr. Brown made Elizabeth a doll called Minnehaha. It was the Browns’ television, I believe, which was responsible for my teenage fantasies. No, not those fantasies. In those twilight moments between being awake and asleep, I would hear the three discordant notes which Mum said were coming from their television. I believe it was a closing down signal. This led me into thinking how wonderful it would be if you could have a picture frame on your wall and a gadget that could tune in to and display in this any of the films currently being shown on any of the four cinemas Wimbledon then boasted. We didn’t have a television and the only one I had ever seen was a small wooden cabinet bearing a postage stamp sized screen. This was for the occasion of the coronation in 1953 when those of us at school who didn’t have a television were billeted with those who did. Being a tall lad I was seated at the back from whence I peered at a tiny black and white haze. Little did I imagine, in that teenage dream world, what my grandchildren can now hold in the palms of their hands. Elizabeth and I took time out to visit the current exhibition of her artist friend Hilda Margery Clarke, where we also met another local artist, Susan Anderson, and had a good chat. As I have mentioned before, Margery was a tutee and close friend of L. S. Lowry, as is evident in some of her work. This collection was a fascinating forty year retrospective. Jacqueline brought Mum up to join us for the evening meal. My niece Danni and her boyfriend Andy had also arrived earlier. This naturally led to the usual reminiscing, some of which may find its way into future posts. The journey back was through gorgeous early summer evening light, bringing everything into sharp focus and casting long shadows across the fields. Last night and early this morning the only birdsong in the garden was the magpie warning call, a kind of incessant chattering. There certainly are a lot of them about. This morning, however, the mother fox and a cub, basking in the sunshine, were definitely the subject of the warning. Mum was studiously ignoring a magpie making pecking raids on her backside. Or perhaps it was de-fleaing its target. She appeared more interested in me watching from the window. This reminded me of the blackbirds at Lindum House. During magpie season they would dive-bomb the raiders, with about as little effect on them as this one had on the fox. There would be a significant decrease in the other bird population the year of their appearance. The following year, no magpies, and lots more other birds. A clear demonstration of nature’s natural balance in action. Arriving at Elizabeth’s in West End after a beautiful drive through Surrey and Hampshire we were delighted with the blooming spring garden, showing dividends from all our hard work through the autumn and winter. New beds had been dug; they and older ones had been thoroughly composted; new lawn edges created; major projects like removing a bamboo plantation; and quite a bit of planting. Elizabeth tells us that many of her plants are looking much healthier and more profuse than ever before. It is amazing what composting can achieve. Mind you, the same goes for weeds. The house (The Firs) and garden had once been owned by Richard Barbe-Baker, a local born internationally renowned arboriculturist. One of the beds we have resuscitated lies in the centre of a large concrete ring. This is the remains of a summer house the 12 year old Richard made for his mother one year. This summer’s tasks are rather less arduous than the last. We just have to weed, finish off a couple of beds, and carry out general maintenance. Rather fortuitous since Elizabeth is the only one getting any younger. The major task today has been retraining a rambling rose up an arch bought at the Bishop’s Waltham Garden Fair three weeks ago. This had clung precariously to the false acacia inside the concrete ring which had been blown down in the bad weather. Actually we are rather chuffed at the result, despite the rose having taken revenge on our flesh. We were joined this evening by my other sister, Jacqueline, and enjoyed a succulent roast lamb meal prepared by Jackie, accompanied by an excellent Cote du Rhone. Taking advantage of the beautiful weather I walked up to Wimbledon common just before midday with a couple of books and sat reading by the pond in which I’d sailed my boat as a child. The bench I had chosen was inscribed IN MEMORY OF DOUGLAS WARD CAMPBELL. As always when passing Wimbledon Library, situated adjacent to St. Mark’s Place, where Jack (see post of 13th. May) stood awaiting his next charge, my thoughts turn to Miss Downs. Miss Downs was a teacher at St. Mary’s Russell Rd. Roman Catholic school which I and all my siblings attended. Miss Downs was adamant that we should read three books a week. Consequently, dutifully, if not religiously, Mum took us on a regular weekly trip to the library where these treasure troves were to be found. Was anyone else out there nurtured on Patricia Lynch’s Brogeen stories? Every Sunday morning my brother Chris and I would attend Mass in the Church of the Sacred Heart on Edge Hill and go on for breakfast at Auntie Gwen’s in Latimer Road. Auntie Gwen was my godmother, not the proprietor of yet another greasy spoon. Mum was not a Catholic and Dad, at that time, was not practising. In our case ‘attend Mass’ was a loose description. When we discovered that it was only if you missed the crucial parts of the ceremony each Sabbath that you were condemned to Hell, we started stretching it a bit. We would sneak in just before the Gospel and slide out just after Communion. What we didn’t know was that Miss Downs was part of the congregation. It was therefore something of a shock when we were summoned to her room at school to be asked to explain our behaviour and to be given what for. This seemed pretty bad luck to us, and a bit out of order. The long arm of the school was everywhere. So…… for a lifetime’s pleasure from reading, Miss Downs and Mum, I thank you. I still read every day. For a sharp lesson in the wisdom of sussing out every possible drawback when contemplating manipulating the rules, Miss Downs, I, er, thank you. I took the 93 bus back today, walking the long way round from Morden Station and stopping for an excellent shish kebab with a first rate salad at Morden Best Kebabs on London Road. I have not been able to eat a doner since Becky told me what went into them. This evening Jackie and I ate at the Watch Me, our favourite Sri Lankan restaurant on Morden Road. Presumably it gets its name from the fact that, if you feel so inclined, you can watch the team of chefs performing behind a long window. The food is wonderful, especially for me as hot comes as standard. The staff are all very friendly young men, one of whom plays cricket. The atmosphere is of a family gathering. Alomost all the other customers are Sri Lankan families, the women wearing gorgeous saris, especially if there is, as often, a party going on; and really very small children running about. The fathers are very hands-on Dads. Waiters are adept at weaving in and out of darting infants whilst balancing plates of food. You are not expected to order your ‘mains’ until you have eaten your starters, and you are never approached with the bill. As far as they are concerned you are there for the evening. We are indebted to my sister Jacqueline for the introduction to this establishment.